Cicadas are the elders of the insect world. 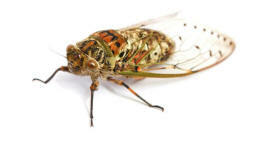 Some species of cicada live up to 17 years, though most of the time is spent underground. Most closely related to leaf, tree, and plant hoppers, cicadas are large singing insects, often colloquially called locusts. This is incorrect, as locusts are species of swarming grasshoppers. Because the periodical cicadas emerge in such enormous numbers, of up to 1.5 million individuals per acre, over large areas along the eastern seaboard and west to Kansas, they were interpreted as locusts by early American settlers, an error which has continued to the present. 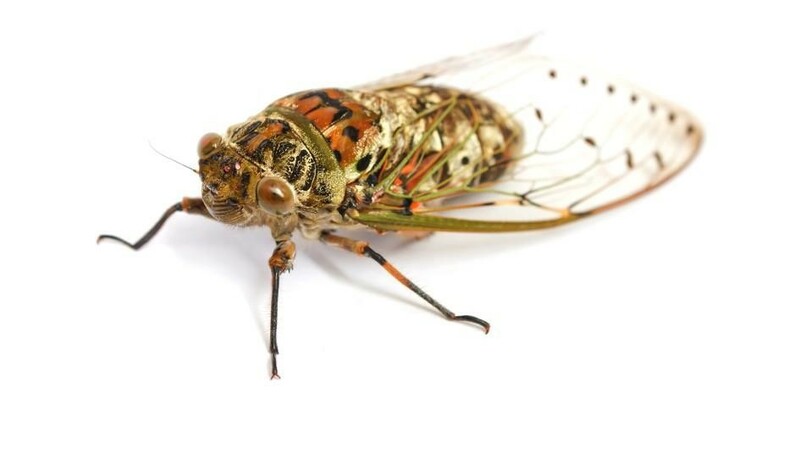 Cicadidae is one of two families of cicadas (order Hemiptera) which includes an estimated 2500 described species in three subfamilies and many others yet to be described, found in temperate to tropical climates on every continent in the world except Antarctica. 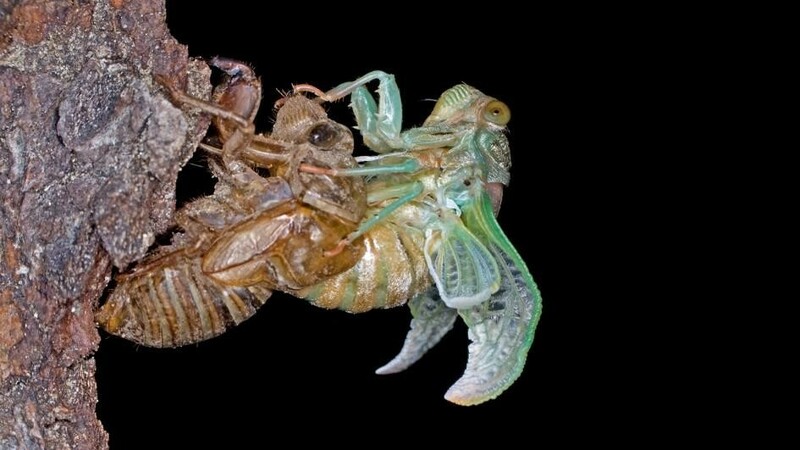 The other cicada family is the primitive Australian Tettigarctidae (hairy cicadas), which contains two species. Within these groups there are the ‘dog-day’ cicadas which are very dark with greenish markings and spend four to seven years under ground before emerging in July and August. New groups of young are born every year, so every year different generations emerge. The ‘Periodical’ cicadas are dark with red eyes. These emerge in late May and early June after 14 to 17 years under ground. Above ground, male cicadas fill the air with shrill buzzing sounds, the result of small drum-like plates called tymbals, on the abdomen of the male, that the cicada vibrates rapidly. 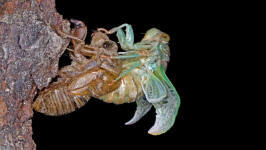 While many people find the sound annoying, the male cicada uses it to attract female cicadas for mating. 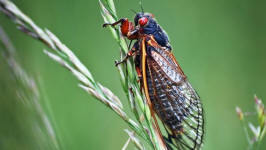 Both male and female cicadas die after about five weeks above ground. Female cicadas lay from 200 to 600 eggs in tiny holes made in branches and twigs in trees and shrubs. Cicada young—called nymphs—hatch from the eggs and immediately drop to burrow underground, where they attach to tree roots. The nymphs remain attached to the roots, sucking tree sap, for most of their lives. Depending on the species the nymphs live up to 2.5 meters (8.2 feet) below ground, feeding on plant sap from roots, which they pierce with their long proboscis. In the nymphs' final developmental stage, they dig their way to the surface with powerful digging legs, pull themselves up to a plant stem, and molt into an adult with prominent eyes and clear wings. They leave behind a very recognizable larval casing, with the slit on the dorsal side from whence the adult emerged clearly visible. Cicadas are quite diverse in looks and behaviors. Most adults are between 2 to 5 cm (0.79–2.0 in) in length. Cicadas are eaten around the world by many cultures and different animals and are used in traditional medicines in Asia, and surface in many stories and customs. 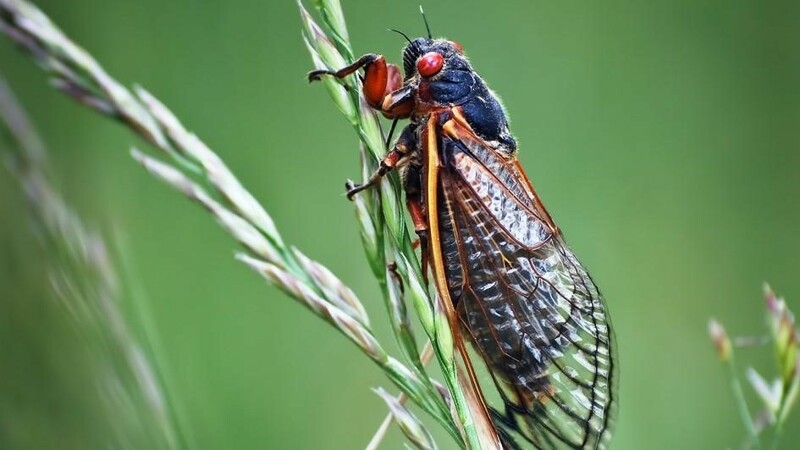 While a cicada might mistake you for a food source and try to poke you with its proboscis, these insects do not sting or bite and pose no danger to humans.